The court denied defendant's motion to transfer venue of plaintiff’s patent infringement claims on the basis of a forum selection clause in defendant's Terms of Service. In doing so the court expressed hesitation to establish precedent "that would potentially foster satellite litigation in every patent case involving a social networking market participant." "Should this Court decide that a social networking market participant can limit the forum in which it can be sued for patent infringement via Terms of Service governing 'access to and use of' that social networking market participant's website and services, foreseeably, other District Courts in similar cases will be called upon to decide, inter alia, whether other plaintiffs' employees ever agreed to online Terms of Service, whether those employees could bind their plaintiff employers to those Terms of Service, whether those Terms of Service contained a forum selection clause, whether any such forum selection clause was enforceable, and, as the Court is asked to decide here, whether that forum selection clause contemplated coverage of patent infringement claims. The Court refuses to set this precedent." Plaintiff's motion for summary judgment on defendant's false marking counterclaim was denied where, although the court found the product was marked falsely, there was a factual dispute regarding intent. "[Plaintiff's product] is clearly distinct from what is covered in the [patent-in-suit]. Indeed, the [patent] bears no resemblance to the [product]. . . . [T]he [product] has no projections or recesses, which are clearly required by the [patent]. As such, there is a genuine dispute of a material fact as to whether [plaintiff] intentionally deceived the public into believing that the [product] was covered by the [patent-in-suit]." Plaintiffs' motion to dismiss defendant's inequitable conduct claim for failing to plead with particularity was granted. "[Defendant's] cursory allegations that the inventors were aware of the material aspects of the alleged prior art based on citations to those works in unrelated publications fails to meet the standards for establishing the 'what,' 'where' and 'how' of the material omission. In order to satisfy this standard, the pleading must set forth 'which claims, and which limitations in those claims, the withheld references are relevant to, and where in those references the material information is found' as well as 'the particular claim limitations, or combination of claim limitations, that are supposedly absent from the information of record.' . . . [Defendant's] assertion that 'the named inventor[s'] own publications [which cite various parts of the alleged prior art publications]' is too vague to satisfy the heightened pleading requirements of Rule 9(b)." The court granted defendant's motion in limine to exclude plaintiff's damages expert from using the entire market value rule to establish a reasonable royalty because Plaintiff did not offer credible evidence that customer demand for defendant's elevator system was based on the patented feature. "While one can assume that those who wanted the feature found it desirable and were willing to pay for it (with [one exception]), there is no way of knowing (short of interviewing the customers, which was never done) whether this feature alone drove the decision to purchase from [defendant]. . . . Finally, [plaintiff's expert] appears to have used the wrong standard. He opines that the patent feature was a 'substantial basis for demand' at the seven accused installations. But the test. . . is whether the patent component was of such paramount importance that it substantially created the value of the component parts -- thereby making it 'the basis for customer demand.'" The court could exercise subject matter jurisdiction over plaintiff's declaratory relief action premised on two foreign infringement actions. "The Court recognizes that foreign patent litigation, although not dispositive of the existence of an actual controversy, is one factor to be considered in a full analysis of the circumstances. Foreign litigation is especially relevant when, as here, the litigation involves the same parties, essentially the same patent claims, and the same accused device. [Plaintiff's] well-pleaded factual allegations establish that an actual case or controversy exists which supports this Court’s jurisdiction over this declaratory judgment action." 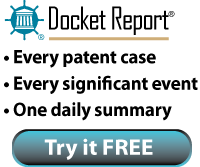 Docket Navigator has posted a new chart reflecting the success rates in patent litigation cases for motions to stay pending reexamination. The data reveals that overall, litigants in the Northern District of California have the greatest chance of winning these types of motions, while litigants in Delaware have the slimmest. View the complete chart. The court denied defendants' motion to transfer venue for convenience where some of the defendants had incorporated in the forum state. "[T]he Court emphasizes that three of the four domestic Defendants chose to incorporate in Delaware. . . . Thus, 'absent some showing of a unique or unexpected burden, a company should not be successful in arguing that litigation in its state of incorporation is inconvenient.' No such showing has been made here." The court granted defendant's motion in limine to exclude evidence of a third party software add-in as a proxy for the value of the patented technology. "[I]f [plaintiff] intends to use an add-in as a proxy for what the Day patent technology may be worth to [defendant], [it] needs to show a market for the add-in. If there is no market for the add-in, there is no evidence that consumers would buy the add-in. Moreover, if the add-in was then incorporated into [defendant's product], there is no evidence that any consumer would pay [defendant] anything additional because of the inclusion of the add-in. . . . [W]ithout evidence that there is a market for this add-in, the add-ins analysis does not meet the requirement for damages being based on 'sound economic and factual predicates.'" Defendant's motion to compel plaintiff to produce its settlement agreements with two other defendants in this case was granted. "[T]he Federal Circuit’s ruling in [ResQNet.com, Inc. v. Lansa, Inc., 594 F.3d 860 (Fed. Cir. 2010)] forecloses [plaintiff's] categorical contention that '[a]greements reached to resolve patent litigation are not relevant to the calculation of a reasonable royalty'. . . . [Plaintiff] has offered no argument that anything about the particular licensing arrangements contained in its settlement agreements with the [other defendants in this case] renders them irrelevant to the reasonable royalty calculation in this case; instead, [plaintiff] has relied on its faulty, blanket assertion that licenses arising from settlement agreements generally lack any relevance to a reasonable royalty determination." Judge Solis compares false marking to "someone who says, 'I am not married,' when indeed, they are." Defendant's motion to dismiss plaintiff's qui tam false marking action for failing to plead with particularity was denied. "By using the word 'patent' in its advertisements connected with the sales of its cotton candy machines, when it had no such patent, [defendant] has acted as someone who says, "I am not married," when indeed, they are." Defendant's motion to dismiss plaintiff's qui tam false marking action as unconstitutional was denied. "This Court agrees with the government's rationale that the [False Marking Statute] is subject to control mechanisms not listed in the statute. . . . [FRCP] 24(a)(2) gives the government a controlling mechanism through its right to intervene. . . . Further, the division of the fines imposed. . . provides another control mechanism. Without notifying the government of its suit, relators cannot seek their portion of the civil penalty." The court granted defendant's motion for summary judgment of anticipation and rejected plaintiff's argument that its satellite television patent was conceived prior to the effective date of the anticipating prior art. "Corroboration is required where a party seeks to show conception through the oral testimony of an inventor. . . . At best, all of the evidence [plaintiff] uses to support its conception argument shows a general goal for creating a satellite system that eventually matured into the [patent-in-suit]; this is insufficient. . . . "[N]one of the evidence produced by [plaintiff] satisfies the particularity requirement for conception. Indeed, none of the three documents cited by [plaintiff] discuss any of the following limitations from the [patent-in-suit]: (1) 'a first switch connected to a first input;' (2) 'a second switch connected to a second input;' (3) 'a data stream junction;' (4) 'a controller for receiving a channel select input;' or (5) 'a memory device operatively connected to the controller'." The court denied plaintiff's motion in limine to exclude defendant's damages expert from testifying about his real-world negotiations theory. "Under this theory, two parties come to a negotiation with their 'best alternative to a negotiated agreement' and a reservation price. The two parties will only come to an agreement if there is an overlap between their 'zone of potential agreement'. . . . [Plaintiff] argues that this theory ignores that the hypothetical negotiation between two parties should (1) assume the patent is valid and infringed, (2) allow parties to walk away, and (3) ignores information about the 'Book of Wisdom.'. . . The Court agrees with [defendant] that there is no single correct approach at calculating reasonable royalties. . . . [Defendant's expert's] negotiation that he applies to the facts of this case is widely accepted in the scientific community and has been published in many journals. The Court concludes that [his] negotiation theory is based on reliable principles and methods." Defendant's motion to compel plaintiff to disclose how it configured the accused products to produce alleged infringement was granted. "[Defendant] complains that neither the screenshots provided, not [plaintiff's] infringement contentions and citations to various portions of [defendant's] source code, disclose the particular configurations of the accused products that [plaintiff] alleges infringe. . . . Forcing [defendant] to 'guess' as to what infringement [plaintiff] alleges by its screenshots, regardless of whether [plaintiff] provided sufficient detail as to other infringement contentions, violates the principles of both Rule 26 and Pat. L.R. 3-1. . . . Because [plaintiff's] screenshots here merely show the result of the accused  process, the specific allegedly infringing product configurations and additional end use programming -- conditions that are at least arguably 'material to patentability' -- are required to properly put [defendant] on notice." The court denied in part defendants' motion to exclude expert testimony concerning the entire market value rule. "The defendants argue that [plaintiff's damages expert] cannot apply the 'entire market value rule' in this case because the patented feature of the accused product has not been shown to provide the basis for the customer demand. Indeed, the fact that the patented feature does not provide the basis for the customer demand is largely undisputed. . . . If this rule were absolute, then it would put Plaintiff in a tough position because on one hand, the patented feature does not provide the basis for the customer demand, but on the other hand, the most reliable licenses are based on the entire value of the licensed products. . . . Plaintiff bases its analysis on approximately 13 comparable licenses of the patents-in-suit that also use the entire base of the licensed product, and Defendants do the same. Therefore, [plaintiff's expert's] use of the entire value of the accused products is 'economically justified'. . . . Under the facts in this case, Plaintiff may base its reasonable royalty analysis on the entire value of the accused products, despite not showing the accused features provide the basis of the customer demand. In this Court's view, Federal Circuit jurisprudence regarding the 'entire market value rule' allows for this result, and further, Federal Circuit damages jurisprudence encourages this result by placing a large emphasis on comparable licenses of the patents-in-suit." In granting defendants' motions to transfer venue, the court gave little weight to a non-practicing entity plaintiff's choice of venue. "Adiscov is a non-practicing entity, formed only for the purpose of protecting the intellectual property rights of the '760 patent. Furthermore, though the members of Adiscov may live in the district, there is little connection between the forum and the cause of action. . . . Therefore, the court finds that the plaintiff's choice of forum does not warrant a strong presumption and instead counsels that transfer may well be proper." Adiscov, L.L.C. v. Autonomy Corp., PLC, et. al., 2-11-cv-00201 (VAED June 9, 2011, Order) (Smith, J.). In denying defendant's motion for attorneys' fees under 35 U.S.C. § 285, the court found that plaintiff did not assert objectively baseless positions in subjective bad faith because plaintiff conceded invalidity (subject to appeal) following the court's claim construction. "Once [plaintiff] realized it could not prevail at trial with the construction provided by the Court, [plaintiff] conceded to summary judgment in order to appeal the Court’s construction. . . . The Court finds that because [plaintiff] conceded to invalidity when its theory of validity was no longer viable under the Court’s claim construction, [plaintiff] was not 'manifestly unreasonable.' Therefore, the Court does not find this case to be exceptional." Plaintiff's motion to extend the 30-month FDA stay on defendants' ANADA approval was granted. "No doubt, [defendant's] actions -- in waiting four months after the close of discovery and only five months before trial to change its ANADA -- provide a strong basis for this Court to extend the stay. . . . [B]ecause [defendant] changed its ANADA application so late in litigation. . . This Court finds that [it] failed to reasonably cooperate in expediting this action." In denying defendants' motion to transfer venue for convenience, the court rejected the argument that the location of discovery and witnesses should be given weight in the court's convenience analysis. "In this electronic age, there are no substantial burdens associated with discovery or witness availability that support the need for transfer. With respect to discovery, documents generally are stored, transferred and reviewed electronically. . . . With respect to witnesses, generally the parties agree to take depositions where the witnesses are located (or the court can so order). Moreover, for those cases that get to trial, only a handful of witnesses testify live, and only a very small proportion of those documents produced during discovery are used as trial exhibits. Given these realities, this factor is outdated, irrelevant, and should be given little weight, if any, except for those rare exceptions where truly regional defendants are litigating." The court granted defendants' motion to transfer venue even though the reported time to trial was almost twice that of the Eastern District of Texas. "The parties agree that the time to trial is almost twice as long in the Western District of New York (47.7 months) than in the Eastern District of Texas (24.2 months). The court understands the parties’ concerns about the extended time to trial in the Western District. However, while 'the speed with which a case can come to trial and be resolved may be a factor . . . this factor appears to be the most speculative . . . and case-disposition statistics may not always tell the whole story.'" In dismissing plaintiff's false marking action, the court agreed with Unique Prod. Solutions, Ltd. v. Hy-GradeValve, Inc., ___F. Supp. 2d __, (N.D. Ohio Feb. 23, 2011) and concluded that the qui tam provisions of the false marking statute violate the Take Care clause of the U.S. Constitution. "[T]he fact that notice of all pending patent cases is provided to the PTO within one month of filing . . . does not constitute sufficient notice to the Executive Branch. This notice is not expedient enough to provide the United States with sufficient time to protect its interests, and is not directed to the Department of Justice -- the agency responsible for representing the United States’ interests in a false marking suit. . . . While the United States could prevent a section 292(b) relator from voluntarily dismissing the case upon intervention, this requires the Court to order intervention on the United States’ motion in the first instance. Although the Federal Circuit has reversed a district court for refusing to permit intervention in a false marking suit under Rule 24(a)(2), it is not clear to the Court that intervention will or must be ordered in any given case. Moreover . . . a section 292(b) relator could voluntarily dismiss a case before the United States even has the opportunity to seek intervention at all. Thus, despite the external protections available, the United States is not able to effectively exercise even a basic degree of control over a section 292(b) relator’s case." The court denied plaintiff's motion to reinstate a declaratory relief action that it voluntarily dismissed two years earlier in response to defendant's motion to dismiss for lack of subject matter jurisdiction. Defendant's argument that it had "never asserted any claim of any kind against [plaintiff], never threatened it with suit and, indeed, never engaged in any conduct whatsoever directed against it" did not require defendant to return to the instant court to pursue infringement claims against plaintiff two years later. "[Defendant] was not required to file a motion to reinstate a case that was voluntarily dismissed — by [plaintiff] — almost two years earlier when it determined that it was necessary to pursue a patent infringement action against [plaintiff]. Nor was [defendant] required to, as [plaintiff] suggests, inform 'the Clerk of Court that its case was essentially the same facts, patents and law that had been asserted by [plaintiff in the 2009 Action] so that the Clerk could have determined whether the case should have been assigned to [a particular judge]." The court granted plaintiff's emergency motion to compel compliance with a protective order and require defendant to install integrated development environments (IDEs) on a stand-alone computer used to review defendant's source code. "[Defendant] has loaded its source code on a stand-alone computer for review. [Defendant] has further provided a standard text-editor (Notepad), a source code editor (Notepad ++) and a comparison tool (Beyond Compare) to facilitate [plaintiff's] review of the source code. . . . [Plaintiff] represents that due to the modular nature of source code, the IDEs will allow its experts to follow various jumps between modules contained in separate files -- replicating the behavior of the source code during execution. . . . [Defendant] contends that loading the IDEs on the source code computer will require the installation of additional hardware, third-party software libraries, configuration files and running servers – all at additional cost to [defendant]. . . . The Court finds that installation of the two IDEs is not prejudicial or overly burdensome to [defendant]. . . . Accordingly, the Court hereby grants [plaintiff's] motion without prejudice as to Hyundai requesting a meet and confer and ultimately the Court’s intervention should the installation and operation of these tools require additional costs as enumerated above." The court denied plaintiff's motion to compel the production of highly confidential information concerning defendant's future products that were still under development and would not be sold until after the patent-in-suit expired and rejected plaintiff's argument that such information was relevant to its "accelerated market entry" damages theory. "'Accelerated market entry' ('AME') is a recognized theory of damages . . . [that] compensat[es] for lost sales after the patent’s expiration based on defendant’s entry into 'the market at a level accelerated by its earlier infringement.' . . . Defendant argues that AME does not apply in this case because Plaintiff does not manufacture or sell products and cannot recover lost profits. . . . Plaintiff argues that there are very few AME cases at all, and while it is true that they involve patentees who manufacture their own product, there is no reason why the theory should not apply equally to patentees who license their products and collect royalties from third party manufacturers. While it is true that infringing sales could decrease the post-expiration sales and profits of those third party manufacturers, the patentee’s damages could only be the corresponding decrease in royalty from those decreased third party sales. The law is clear, however, that royalties are not paid after expiration of a patent. Accordingly, the Court sees no basis for a post-expiration claim of lost royalties, whether based on AME or otherwise." False Marking: "The Court does not need to be notified every time a judge makes a decision in one of those cases"
"The issue involved in this case is now pending before hundreds of judges in the federal court system. The Court does not need to be notified every time a judge makes a decision in one of those cases, especially if such decisions represent no "change in the law" binding on this Court. See Local Rule 7.1 (c) & (g). The Court is well able to do its own research as needed, and filling this case's record with non-binding cases will simply clutter the file. Accordingly, the Court STRIKES the notice of supplemental authority (Doc. 58) and ORDERS that henceforward notice of supplemental authority may be filed in this case without leave of court, but only if it is authority binding on this Court or is a decision by a United States Court of Appeals." Defendant's motion for summary judgment of invalidity of plaintiffs' insurance claim processing patents was granted under Bilski v. Kappos, 130 S. Ct. 3218 (2010). "[Defendant] contends that the claims of the [patents-in-suit] contain abstract ideas and fail the machine or transformation test. . . . because their claims require only aspects of a general purpose computer. Moreover, [defendant] contends that the transfer of data regarding insurance cases from one electronic file to another does not transform physical objects to another state or thing. According to [defendant], all of the claims reflect field of use restrictions or insignificant post-solution activity and, therefore, constitute unpatentable abstract ideas under § 101. . . . This court previously determined that the [patents-in-suit] fail to satisfy the machine or transformation test. . . . Using the court's previous machine or transformation determination as an 'important clue' in the analysis, the court must now determine whether the claims as a whole convey an unpatentable, abstract idea. . . . [T]he [patents-in-suit] are directed to abstract and, therefore, unpatentable, methods and systems for generating file notes and tasks to be performed for insurance claims. The patents are directed to concepts for organizing data rather than to specific devices or systems, and limiting the claims to the insurance industry does not specify the claims sufficiently to allow for their survival." Following a jury trial, the court determined that plaintiff's patents were not unenforceable for inequitable conduct under Therasense, Inc. v. Becton, No. 2008-1511, at 18 (Fed. Cir. May 25, 2011), because defendants failed to establish intent to deceive. "[The first named inventor of the patents-in-suit] consistently testified in deposition and at trial that he believed there was nothing like his invention prior to September 1998 and that he also believed that no one had even recognized the problem that his invention was designed to solve. . . . [The inventor] was at no time inconsistent regarding the sincerity of his belief that there was no material prior art -- i.e., that he had uncovered a breakthrough invention. Considering [the inventor's] testimony in light of the evidence as a whole, the court concludes that specific intent to deceive is not the single most reasonable inference that must be drawn from the evidence."